Within the Western genre, there are some frequently recurring themes, including range wars, cattle drives, wagon trains, town takeovers, and travelers banding together against a common enemy. 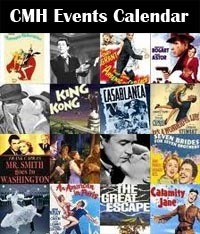 While some viewers might find the familiar ideas repetitive, for me there is great pleasure in seeing each Western film’s unique spin on a story. A theme which doesn’t show up quite as frequently as others but which I find quite enjoyable is what I like to call the “snowy Western.” In these films, the winter weather provides a striking backdrop, and frequently the setting also serves as a key plot device. One such wintry Western is 20th Century-Fox’s The Secret of Convict Lake (1951), in which prisoners who escaped from a Carson City jail seek refuge from a blizzard in a small Sierras settlement where the men happen to be away. Glenn Ford, having fallen in love with Gene Tierney (what man wouldn’t?! ), stands up to his fellow outlaws; by the time the storm fades and a posse arrives, Ford and the settlers have handled the outlaws in their own way. The Wild North (1952) is another snowy Western, which also fits into what I think of as the “Northerner” subgenre, with a Canadian setting! Mountie Wendell Corey is charged with bringing in a trapper (Stewart Granger) to face a murder charge, but in the end, the trapper saves the Mountie’s life as they battle the harsh winter elements for survival. 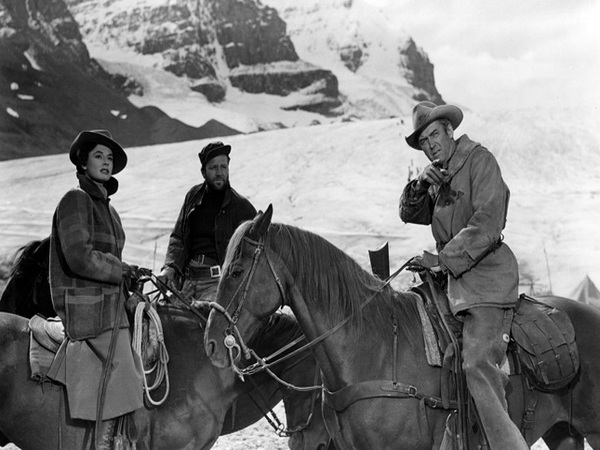 Stewart Granger, Wendell Corey and Cyd Charisse in The Wild North (1952). 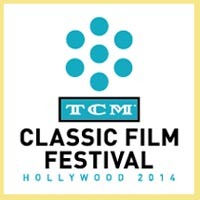 At a screening, I attended of William Wellman‘s Track of the Cat (1954), his son William Wellman Jr. described the film as “offbeat” and “a black and white movie shot in color.” That’s a wonderful summation of a wintry film about a dysfunctional family, which features Robert Mitchum riding through the snow in order to hunt down the big cat which killed his brother. The contrast of the few colors seen in the film against the blinding white backdrop of the snow is one of the film’s most memorable aspects. A Movie Poster for Track of the Cat (1954) starring Robert Mitchum. The Far Country (1954) is one of my favorite James Stewart Westerns directed by Anthony Mann. While not as wintry as the previously mentioned movies, there are great shots of Stewart and cast riding through the snow in “Alaska” — actually Jasper National Park in Canada — as well as gorgeous snow-covered mountains. With snowdrifts in the background, it seems genuinely cold throughout much of the movie, making one long for some of costar Walter Brennan‘s beloved coffee. The first time I saw the film I remember thinking one could almost feel and smell what it must have been like standing right there as the cameras rolled. 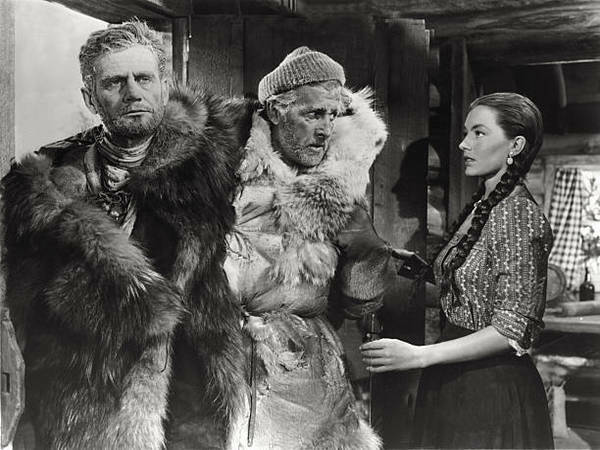 Ruth Roman, Henry Morgan and James Stewart in The Far Country (1955). 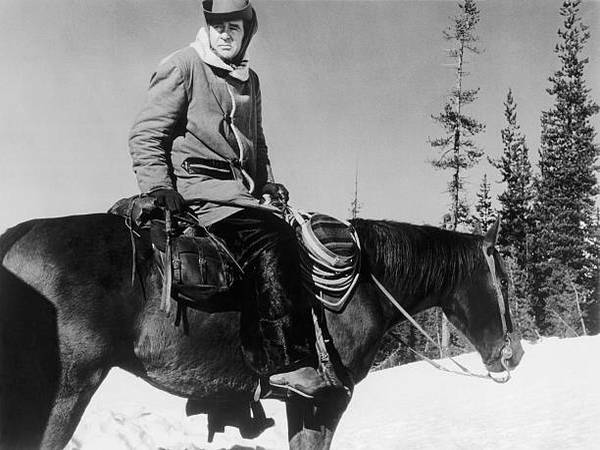 And who can forget the shocking final shot of Robert Taylor in the snow in The Last Hunt (1956)? An excellent modern spin on the snowy Western is Wind River (2017), replacing the traditional sheriff and deputy with an FBI agent (a woman, in fact, played by Elizabeth Olsen) and a Fish and Game employee (Jeremy Renner). Thought it’s more gritty in terms of depicting violence, Wind River fits right in the tradition of these earlier films and is highly recommended for classic film fans. I’ve just watched yet another winter Western for the very first time, Day of the Outlaw (1959), and will share my impressions of this memorable film below at greater length. Day of the Outlaw was directed by Andre De Toth, who had previously directed a number of good Randolph Scott Westerns and a particularly fine Joel McCrea Western, Ramrod (1947). The script for Day of the Outlaw was written by Phillip Yordan, based on a novel by Lee E. Wells. 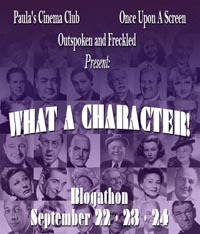 The cold winter weather is front and center from the movie’s very first scene, as rancher Blaise Starrett (Robert Ryan) and his loyal employee Dan (Nehemiah Persoff) arrive in the small settlement of Bitters. 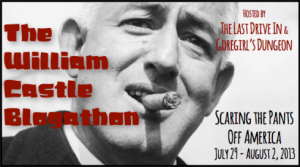 Starrett is intent on killing farmer Hal Crane (Alan Marshal) for fencing off his land, but the honest truth is that Starrett would like to make a widow of Crane’s wife Helen (Tina Louise of Gilligan’s Island), with whom he once had an affair. A showdown between Starrett and Crane is immediately looming when suddenly Captain Jack Bruhn (Burl Ives) and his outlaw gang arrive in town, loaded with stolen money and seeking refuge from their hard, wintry ride with the cavalry in pursuit. Bruhn promises the townspeople that his men won’t drink, harm the womenfolk, or shoot up the town but his control over his men is only good as long as he’s alive. The town veterinarian (Dabbs Greer) is coerced into removing a bullet from Captain Bruhn’s chest, after which the vet warns the townspeople that Bruhn may not have much time left to live. Blaise Starrett (Robert Ryan) on Horseback in Day of the Outlaw (1959). Bruhn’s restless men (including Jack Lambert, Lance Fuller, and Frank DeKova) insist on dancing with the town’s ladies. Gene, the youngest of the gang (David Nelson), takes a shine to young Ernine (Venetia Stevenson) and is considerate of her and her family, but things start to turn ugly with the other men, who are on the verge of bursting out of control. Starrett has been changed by the experience and realizes he doesn’t want to be a killer like Bruhn’s men. He devises a plan to protect the townspeople by leading the gang out into the mountains, but it may be a trip with no return. Day of the Outlaw is a movie to watch wrapped in a warm blanket, even in August, as everyone in the film looks genuinely, constantly cold, even when bundled up against the weather. 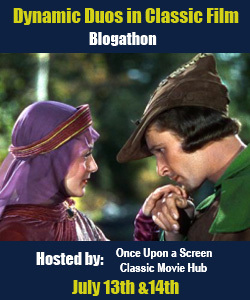 According to IMDb, the movie was filmed in Oregon and around Flagstaff in Northern Arizona, and the snow-white locations, as filmed by Russell Harlan, are stunning. The final sequence of the men trudging through deep snow is visually breathtaking, especially in moments where the sun unexpectedly shines through the trees; it’s especially difficult to watch the poor struggling horses! As hoped by Starrett, the weather gradually takes its toll on the gang, as one by one they collapse, freeze, or fight over the remaining horses. “I’m not doing anything special, just taking some bad men out of a good town”. Ryan’s gradual transformation from villain to hero is another especially interesting element. He looks a bit worn here, but it works in terms of his portrayal of a character struggling to carve out a living in a remote area. He might seem a mismatch for the much younger Louise, but Ryan is nothing if not powerfully charismatic, and their relationship is also in keeping with the story, in which there are very few adults in town; with only three women there in addition to Helen, that greatly limits potential relationships. David Nelson’s Gene, whom Bruhn treats somewhat like a son, is out of step with the rest of the group, raising all sorts of questions as to how he became mixed up with them in the first place. It’s rather interesting to note that the very same year David appeared in this film, his brother Rick was holding off the bad guys in a little Western town alongside John Wayne, in Howard Hawks‘ classic Rio Bravo (1959). The Nelson boys picked their Western roles well. Venetia Stevenson, like Nelson, was from a show business family; her parents were actress Anna Lee (who appeared in John Ford’s Fort Apache) and director Robert Stevenson. Stevenson is effective as a lonely girl attracted to a handsome young man, in a town with few romantic options; unfortunately, her desire to protect Gene from what seems certain death almost undoes Starrett’s valiant plan. For that matter, her concern for her little brother (Mike McGreevey) also leads to trouble. A case of good intentions not working out so well! 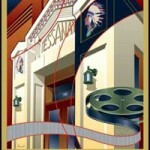 Ives made this film the year after his Oscar-winning supporting role in William Wyler‘s classic The Big Country (1958). It’s a quieter part, but he’s equally powerful in both films as an outlaw with something of a conscience, who will take necessary steps if someone younger crosses a line. In the end, he is rather valiant, taking responsibility for protecting the town from his men by following Starrett, knowing full well the most likely outcome of the journey. 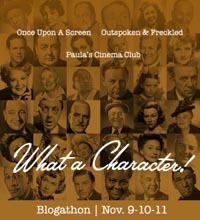 Look for Helen Westcott in a minor role as one of the town’s quartet of women. 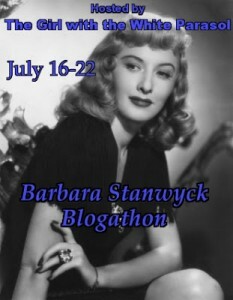 Westcott’s best-known role was probably as Gregory Peck‘s estranged wife in The Gunfighter (1950). Circling back to the beginning of this article, it also just so happens that she was in The Secret of Convict Lake. I very much enjoyed my first viewing of Day of the Outlaw and recommend it, along with the other films mentioned above. Stay warm, everyone! 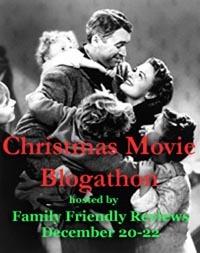 This entry was posted in Posts by Laura Grieve, Western RoundUp and tagged western movies. Bookmark the permalink. 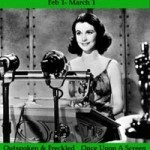 you missed ‘bait’ with hugo haas and cleo moore. Thank you for the recommendations for more wintery westerns and a most enjoyable read. I’ve been looking forward (so has John, I think) to reading your first reaction to “DAY OF THE OUTLAW”, a film which possibly grows on you a little more each time you see it. Ives is excellent and so, naturally, is Ryan who seemed incapable of giving a poor performance, or even anything less than riveting! Love your reviews of all the films here and I know that you and I share a special fondness for “THE FAR COUNTRY”. (By the way, Laura, the woman in the still from the last-named film is Ruth Roman, not Corinne Calvet. I know you won’t mind me correcting that). Hi Jeremy, Thanks so much for taking the time to read, and for commenting. I cannot tell a lie 🙂 that was our mistake (not Laura’s) about the Ruth Roman credit… Not 100% sure how that happened since I can clearly see that it is Ruth Roman! Thanks so much for pointing it out. I beg Laura’s pardon then (grin). Thanks for putting that straight, AnnMarie, and thanks too for hosting this great series on westerns on your very fine blogsite. This is terrific! Thanks for taking the time to write it! A novel subject and fine choices. Venetia Stevenson,was at one time married to Don Everly. RIFLE but as you quiet rightly mention,pretty tough on the poor horses. John K, Venetia Stevenson was first married to Russ Tamblyn. They attended the premiere of THE LAST HUNT(1956) as newlyweds. On a very cold below zero February 16, 1956, Stewart Granger, Russ Tamblyn and his young wife Venetia Stevenson (not yet 18), braved the cold weather to wow the crowds at the premiere in Sioux Falls, South Dakota. They had arrived the day before, flown in on a private plane owned by Robert Taylor, who could not make it for the premiere. Laura, another good post that I enjoyed reading. I’m glad you liked and recommend DAY OF THE OUTLAW, because it is a really good Western. Yes, believe it or not Westerns do take place in locales that aren’t scorching deserts. 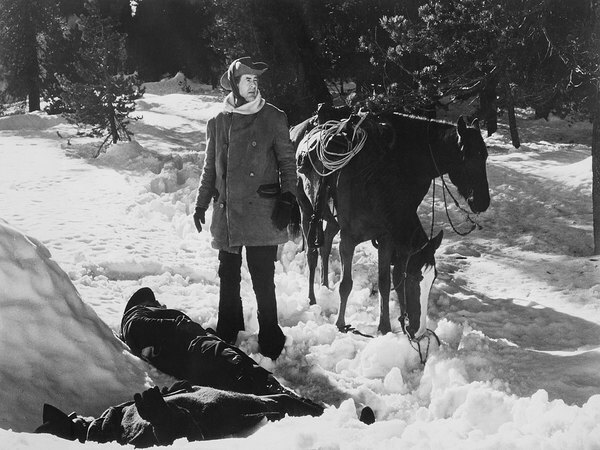 Other “Snowy Westerns” that come to mind are Charlie Chaplin’s THE GOLD RUSH(1925) and Sydney Pollack’s JEREMIAH JOHNSON(1972), scripted by John Milius and Edward Anhalt, with David Rayfiel uncredited. There are others out there. 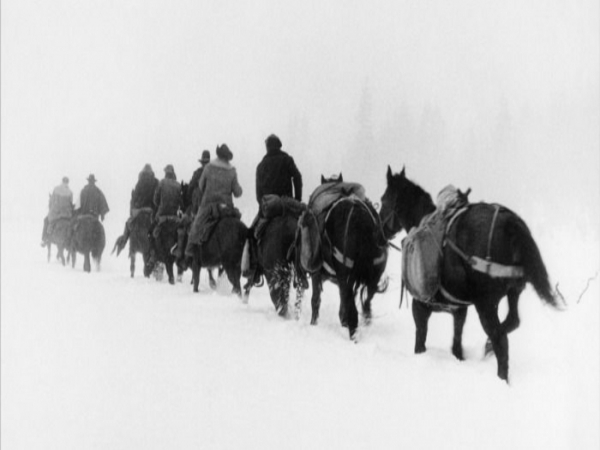 Another great list, love these columns– winter westerns are (wait for it) very cool. 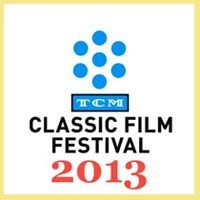 Excellent picks, have to see Day of the Outlaw! One western you didn’t mention with a memorable snow section is The Rare Breed (1966) — James Stewart spends lots of time searching blizzard-wracked Texas for one particular Hereford bull. The bulk of the movie doesn’t take place during the winter, but it’s the winter scenes I remember the best. Really loving this series of posts! Thank you all so much for your comments! I really enjoyed writing this post and am delighted to know it was enjoyed. David, this wasn’t meant to be a comprehensive overview, just a few favorite titles in this subgenre; that said, I always appreciate recommendations! Thank you. I wasn’t aware that BAIT is a Western and have noted to check it out. Patricia, that’s a great line! LOL. I hope you found something new to watch (or a favorite to re-watch) on this list! Jerry and Annmarie, thanks to you both for the photo and caption assist! Greatly appreciated. Jerry, so true, I’m not sure Ryan could give a bad performance. I really need more time to watch movies – a rewatch of THE FAR COUNTRY soon sounds great. Billy, thank you, my pleasure! John K., that’s a great bit of trivia on Venetia Stevenson. I knew she had been married to Russ Tamblyn but not an Everly! Thanks also for sharing the info on the new edition of THE FAR COUNTRY. SPRINGFIELD RIFLE is another title for my recommendations list, thanks much! Walter, thanks for that terrific info on THE LAST HUNT premiere. Love that background. Thanks to you and everyone here I’ve got quite a nice list to expand my “snowy” viewing! Kristina, thank you so much! I appreciate your support immensely. Hamlette, I have THE RARE BREED but haven’t seen it yet, despite having a great cast. Another for the watch list! And thank you so much for the kind feedback. These films are already considered as epic. This is a nice post of yours. I’m glad to know you enjoyed reading it, Jeff, thanks for taking the time to say so. A very belated Thank You for leading me to the Day of the Outlaw, R Ryan was great in so many things. Naked Spur and Clash By Night have been long time favorites, but, this went on my list after my first viewing. I’ve had several viewings now, there will be plenty more. I didn’t have to wait to watch it, there’s a fine copy on You Tube ! I liked your little shoutout to The Last Hunt too. Thank you so much, I’m really delighted to know I helped introduce you to a great movie. This was a fun topic and it’s gratifying to know so many people seemed to enjoy it! Great post, Laura! 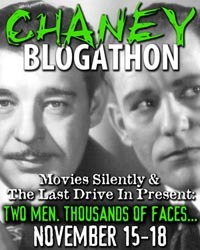 During all my film noir watching, I’ve found that Westerns are a good way to take a break from all the mayhem of noir. 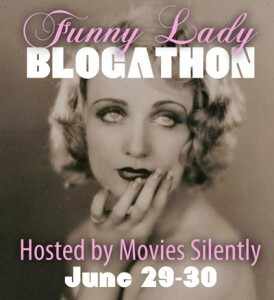 (Only now I’m afraid I’ll like them just as much as I like film noir!) 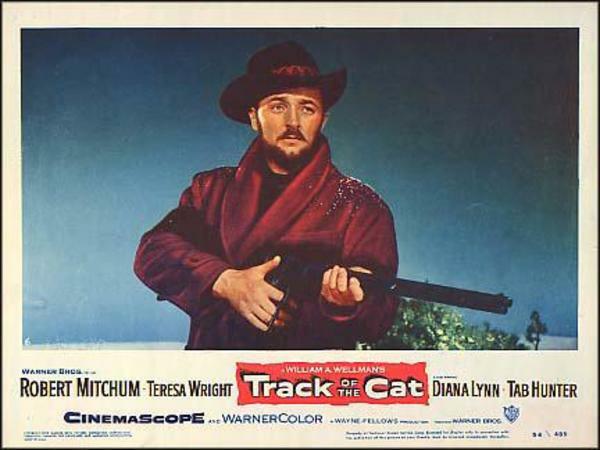 Day of the Outlaw and Track of the Cat are both on my to-watch list, so I really appreciate hearing more about them. Happy Holidays! Thanks, Andy! I think you may find Westerns every bit as addicting as film noir. 🙂 DAY OF THE OUTLAW and TRACK OF THE CAT are terrific gateways from noir into Westerns. I’d love to know what you think once you catch them. Yes! Winter Westerns are essential Westerns. There’s always something about snow that really brings out the atmosphere in a film. I agree, David! Snowy settings make for extra-memorable movies.